Annual percentage rate (APR) explains the cost of borrowing, and it’s particularly useful for credit cards and mortgage loans. APR quotes your cost as a percentage of the loan amount that you pay each year. For example, if your loan has an APR of 10 percent, you would pay $10 per $100 you borrow annually. All other things being equal, the loan with the lowest APR is typically the least expensive—but it’s usually more complicated than that. Although APR is not perfect, it provides a helpful starting point for comparing interest and fees from different lenders. 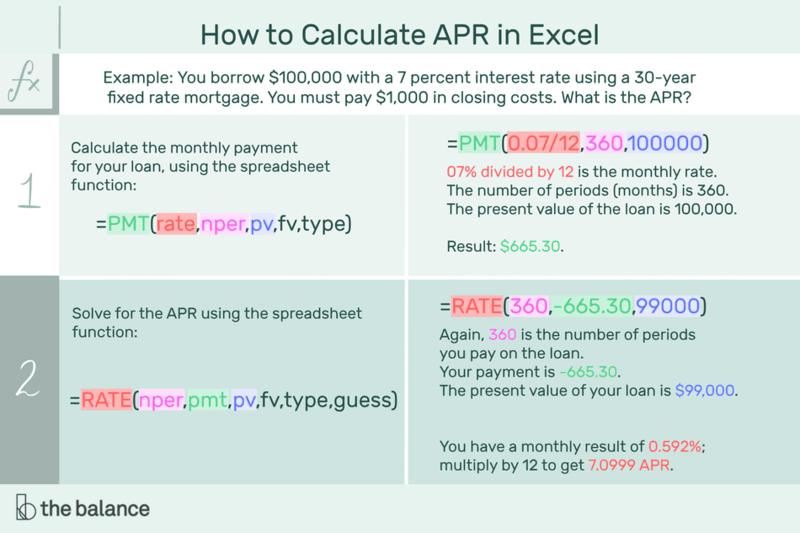 Online calculator: If you just want an APR calculation without doing the math or digging into details, use this Online APR Calculator for a quick answer in Google Sheets. More than interest: APR is unique because it can include fees—in addition to interest charges—and it converts those fees to an annualized cost. That may help you better understand the total cost of borrowing. To get the most out of APR, it’s critical to understand how it works. Sometimes your lender provides an APR, but you might need to calculate APR for yourself (or you might just want to check the lender’s math). Loans can be confusing. Lenders quote different numbers that mean different things. They might include certain costs that you're likely to pay, or they might omit those costs in advertisements and brochures. Apples-to-apples: Even with honest, completely transparent lenders, it can still be hard to tell which loan is least expensive. But APR helps you (as much as possible) get an apples-to-apples comparison of loans by accounting for every cost related to borrowing. With APR, you can determine which loan offer is best. Answer questions like whether or not you should get a low rate with high fees, or accept a higher rate with low fees. You can calculate APR in two ways. Calculate with spreadsheets like Microsoft Excel or Google Sheets. Solve for the monthly payment. Example: You borrow $100,000 with a 7 percent interest rate using a 30-year fixed rate mortgage. You must pay $1,000 in closing costs. What is the APR? Answer: The APR in this example is 7.10 percent. Let’s review how to arrive at that rate. With a spreadsheet: Microsoft Excel and Google Sheets (among others) provide built-in functions that do most of the work for you. Calculating the monthly payment by hand is relatively easy, but it’s best to use an app, computer, or calculator to solve for APR. Before you start, convert the interest rate from percentage to decimal format. 0.07 percent divided by 12 is the rate. You’re using a monthly rate to find monthly payments. The number of periods is 360. That’s the total number of payments or months (over 30 years in this example). The present value of your loan is 100,000, including any additional costs. Again, 360 is the number of periods you pay on the loan, given 12 monthly payments over 30 years. Your payment is - 665.30. This is a negative number, and it’s from Step One above. The present value of your loan is $99,000. This is how much you’re actually borrowing, and explained in greater detail below. You should have a result of 0.592 percent. This is still a monthly rate. Multiply by 12 to get 7.0999 APR. Why does the loan amount decrease from $100,000 to $99,000 in Step Two? We need to calculate the rate for this step using an adjusted loan balance. To get that number, start with the $100,000 "loan" and subtract the $1,000 in fees required to get that loan. Payday loans are notoriously expensive. Those short-term loans might appear to have relatively low rates, but the fees typically make the overall cost of borrowing quite high. Sometimes the charges don’t seem terrible: You might gladly pay $15 to get cash quickly in an emergency. However, when you look at these costs in terms of an annual percentage rate, you may find that there are less expensive ways to borrow. Example: You get a payday loan for $500, and you pay a fee of $50. The loan must be repaid within 14 days. What is the APR? Divide the finance charge by the loan amount. Multiply the result by 365. Divide the result by the term of the loan. Multiply the result by 100. $50 divided by $500 equals 0.1. 0.1 multiplied by 365 equals 36.5. 36.5 divided by 14 equals 2.6071 (this is your APR in decimal format). 2.6071 multiplied by 100 equals 260.71% APR. With credit cards, APR tells you what interest rate you pay, but it doesn’t include the effects of compounding, so you almost always pay more than the quoted APR. Compounding: If you only make small (or minimum) payments on your credit card, you pay interest not only on the money you borrowed, but you also pay interest on the interest that was previously charged to you. This compounding effect makes your cost of borrowing higher than you might think. Instead of looking at the APR, APY would be a more accurate description of how much you pay. Another term to describe the concept is an effective annual rate. No fees: APR for credit cards only includes interest costs. It doesn’t account for the other fees you pay to your credit card issuer, so you have to research and compare those costs separately. Annual fees, balance transfer fees, and other charges can add up. As a result, a card with a slightly higher APR might be better, depending on how you use your card. In addition, your credit card might have several different APRs, so you pay different rates for different types of transactions. To understand exactly how much you pay to borrow with a credit card, see how to calculate credit card payments and costs. With mortgages, APR is complicated because it includes more than just your interest charges. Any quotes you get might or might not include closing costs that you have to pay. Plus, you may have to make additional payments to qualify for the loan (such as private mortgage insurance). Lenders can choose whether or not certain items are part of the APR calculation, so you have to look carefully when you’re comparing loans. Origination fees: You can’t simply rely on an APR quote to evaluate a loan. Instead, check every charge related to your loan to determine if you’re getting a good deal. If you’re comparing lenders, make a list of which charges appear in the quote and which ones are missing. Borrowing forever? You need to know how long you’ll keep a loan to make the best decision. For example, one-time charges and up-front costs may drive up your immediate costs to borrow, but the APR calculation assumes you spread those charges out over the full term of your loan (30 years, on a 30-year mortgage, for example). As a result, the APR appears lower on long-term loans. If you plan to pay a loan off quickly, APR typically underestimates the impact of up-front costs. For more details, see Get the Wrong Loan by Comparing APR. As you compare loans, you might hear additional terms, such as variable APR and 0-percent APR. To learn more about APR on different types of loans, see What Does APR Mean?